Most people who read a lot, maybe even, read a little too much, begin to design their home theater by trying to figure out what their room ratios should be. Room ratios are magic numbers that are supposed to proportion the room to make it sound great. But there’s a problem with room ratios. They were originally developed for engineers who had to design reverb test chambers. By itself, that doesn’t seem like much of a problem. After all, reverb chambers have always been used for testing of acoustical materials. To get the job done, they were designed to create the most uniform sound field possible. That way, it wouldn’t matter which part of which room a test was done, the results would always be the same. The acoustic engineering that went into reverb chamber design is about 80 years old, just about as old as audio. This reverb test chamber theory may or may not be a good way to design your home theater, but it certainly is the reason behind the quest for the original mode-perfect room ratio. By the way, the room ratio that has the top “acoustic quality” is 1.0 to 1.9 to 1.4. But if you ever get to step inside one of those reverb chambers, or even look at some pictures of it, you will notice three things. The marble walled room has a reverb time of about 15 seconds. The speaker position is always in one of the tri corners of the room. And the “listening position” is where the microphone is located, always in another tri corner of the room. Only when the speaker is in a tri corner can all the room modes be generated and only when the listening position, the microphone, is in a tri corner will all the modes be heard. The perfect reverb chamber may sport the most uniform distribution of modes possible but it doesn’t sound musical inside, it doesn’t even sound good. It’s horrible to be inside of one. It’s an acoustic torture chamber, not a listening room. But, why then is so much attention being paid to room modes these days? Most every home theater magazine runs an article in most every issue on room modes. Can everybody be wrong? Well, yes and no. Modes do play a part in room acoustics. Problem is that mode acoustics is not as simple as the magazines make it out to be. For example: If you play a very short tone in a room, just a toot, you hear just a toot. You won’t hear “room modes”. The toot started and stopped before the room mode ever got built up. It takes time to build modes in room. A mode is not built instantly. Before the mode is built up, the sound from the speaker sounds just fine. Many sounds in movies and music are so short lived that they never create a standing wave, otherwise known as a mode. It takes time to build up and create a mode, typically about 1 second. This means that the tone has to be held steady for at least one second in order to create a mode. Actually the amount of time it takes to create a mode is exactly equal to the reverb time, the RT-60 for the decay of the mode. If you like listening to a lot of slow paced organ music, you probably will care a lot about room modes. But if you listen to most music, tones aren’t held long enough to even create modes. If you design a room based on the ideal “mode distribution ” formula, then you will have a room that has its resonant modes uniformly spaces along the frequency scale. And what’s more wonderful is that you can actually hear all this wonder only when your loudspeaker is stuffed into one tri corner of the room and you stand on a ladder with your head is stuffed into another tri corner of the room. What happens if you pull the speaker out of the corner and set it up out on the floor, away from the walls, as if it was a normal speaker and then you go back to the corner and listen? You hear only some of the modes, a subset of all the modes. The speaker can’t stimulate all the modes when it is not in the tri corners of the room. It can only stimulate modes that happen to have pressure zones located where the speaker is located. Next push the speaker back into the corner of the room. Instead of standing on the ladder in the corner, go sit in your favorite listening chair out in the middle of the room. Now you’ll hear a fraction of all the modes that have been generated, a subset of the modes. The only way you can hear all the modes is to have your ear placed in the tri corner of the room, where all modes have pressure zones. This is why corner loaded bass traps (TubeTraps) work so well, they’re always in the pressure zones for every mode. What happens if you also pull the speaker out into the room? Now the speaker generated a subset of all the modes, depending on where it is located, and you will hear a subset of that subset, depending on where your chair is located. Normal speaker locations and normal listening positions end up generating just a fraction of all the possible modes for the listener. And the million-dollar question is: Which modes do you hear and how are well spaced are those modes? The over simplistic, “ideal” room mode calculations are pretty easy to set up on a computer and print out. But move the speaker out into the room and it generates a subset of the room modes. But what subset? Move your chair into a practical position and you can only hear a subset of that subset. But which subset of what subset? Just try to make that calculation. If you do, it won’t be pretty and it’s guaranteed, you won’t find it in any of those room mode magazine articles. Since you can’t use modes for your room design criteria, what can you do? If you are still hooked on modes, there’s hope. What we want a loudspeaker to do in a hifi listening environment is to not stimulate any modes. We don’t want to listen to modes being built and decaying, we want to listen to sounds and music. If at all possible, we want to locate speakers in positions where they cannot stimulate any modes. When a speaker is played outside, it does not stimulate any modes. When the frequency response for a speaker is tested, it is in a mode free environment, either outside or in an anechoic (without echo) chamber. When we want to hear the speaker, it would be nice if we could hear it in a mode free room. But the bad news is: If it’s a room, in that it has a floor, walls and a ceiling, no matter what the shape, it has modes. The good news is that we can locate a speaker in a fairly mode free location in a room. Generally speaking, we need to locate a speaker at the 29% position in a room. This means 29% of the ceiling height off the floor, 29% of the width off the sidewalls and 29% of the length off the end wall. The position of 29% is very close to the minimum room mode coupling location between any set of parallel surfaces. So, how we design a room is to figure out where we want the speakers first and then position the walls so that the woofer is located 29% off each of the three room dimensions. For example, if the left and right mains are 6.5 feet apart, this corresponds to 42% of the room’s width. The width of the room should be 15.5’ wide. If the room is 19’ long, the speaker fronts should be 29% of 19’ or 5.5’ off the front wall. One of the biggest problems for home theater is that the surround speakers are always too close to the listeners. The major reason for this is that people are always trying to make rectangular listening rooms and they place the long dimension front to back and the narrow dimension side to side. They may be sitting 8 to 10’ back from the mains but will be lucky if they are even as much as 6’ from the surrounds. Their electronic buddies sell them adjustable time delays, so the time of arrival is the same. But that’s not the issue at all. What the issue is really is how close they are sitting to the speaker. They are so close they can tell where the speaker is located. People hear the wavefront. It is an expanding sphere for a typical dynamic speaker. People can tell where a sound is by how curved the wave front happens to be. That’s one reason dipole speakers and line source speakers are very interesting to listen to, because they have a cylinder shaped expanding wavefront, horizontally curved but vertically flat. Rotate the room. Play the home theater room sideways. Width is what these rooms need more than length. Put your couch a little off the back wall and your speakers 29% off the front wall. Put your surrounds up high, in front of and near the two back corners. Now everyone gets to listen to the surrounds without anyone in particular being overblown. Some times you’re going to be stuck in a nearly square room that isn’t really very big. Play the room along the diagonal. Put your couch in the middle of the room, slightly back from center. Position the surrounds out from but near the two side corners. Room modes, room orientation, speaker, screen and seating positions are all important. But so is how the room is built. Home theaters have so much subwoofer energy that when played in a normal house, the whole house shakes. A shaking house cracks plaster, rattles dishes off the plate rail and keeps certain members of the household up past their bedtime. Soundproofing is helpful to some degree. However, standard soundproofing was only developed for voice range and voice power. Architectural soundproofing is about speech privacy, not subwoofers. Standard soundproofing methods won’t work well for subwoofers. Soundproofing that uses structural damping materials works better. Standard “room within a room” soundproofing leaves the interior surface of the room completely free to quiver, shake and thunder. It is like listening to music while sitting inside an acoustic guitar. That’s not how it’s supposed to sound. Build in structural damping materials into your soundproofing project and you’ll be very happy. Add corner bass traps and wall mounted treble absorption/diffusion and you’ll be sitting high, somewhere in movie heaven. 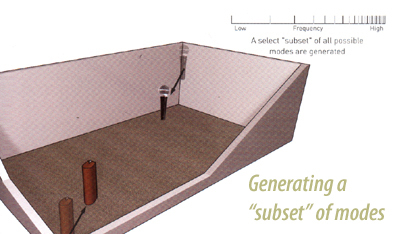 Copyright 2009, Acoustic Sciences Corp. This article was written by Arthur Noxon, a licensed Acoustical Engineer. He is president of Acoustic Sciences Corp and the inventor of the original corner loaded bass trap, the TubeTrap. He has over 35 years professional experience in acoustics, with the last 20 years specializing in blending the art and science of both acoustics and psychoacoustics into the listening experience. He may be reached at [email protected] or by phone: 1-800-ASC-TUBE.